An otolaryngologist/head and neck surgeon might approach the acute trauma patient in a compartmentalized fashion. This approach is inappropriate and may lead to misdiagnosis or inadequate treatment. The patient must be assessed as a whole by the maxillofacial surgeon with the assistance of an emergency department (ED) team and a trauma team. This article discusses a focused initial approach to the trauma patient. For more details, pursue advanced trauma life support (ATLS) training or consult articles on the evaluation and management of fractures and trauma of individual anatomic sites. For patient education information, see the Skin Conditions and Beauty Center, as well as Bruises. The first step in evaluating an acutely injured patient assesses the need for resuscitation. As taught throughout basic life support training, remember the ABCs (ie, airway, breathing, circulation). The otolaryngologist is key in assisting with airway management and in securing an adequate airway. An initial attempt to establish an airway might employ chin lift or jaw thrust positional maneuvers; however, take care to avoid hyperextending the neck because this may injure the spinal cord in patients with cervical spine fractures. An oropharyngeal airway and clearing the airway of foreign bodies may also assist in ventilating the patient. In the unconscious patient, the first step usually is orotracheal intubation. Perform this step with the neck in a neutral position because cervical spine injury is always a possibility. A lateral cervical spine radiograph is essential to evaluate the patient's condition but should not delay securing the airway of a patient in distress (see image below). Any suspicion of laryngeal trauma due to history or physical findings, such as crepitus, ecchymosis, or edema, may necessitate a surgical airway. Attempts at orotracheal intubation in patients with significant laryngeal trauma often are ill advised. Additionally, extensive maxillofacial injury may require a surgical airway. In this case, the preferred emergency airway technique is a cricothyroidotomy. The head and neck surgeon, however, may also perform tracheostomy if time allows. Cervical spine radiograph revealing no fractures or subluxations. Mild osteodegenerative changes are observed in C6-C7. Additionally, nasotracheal intubation may be considered in some circumstances. Nasotracheal intubation is not generally recommended in the patient in acute respiratory distress or in patients with extensive maxillofacial trauma because the procedure requires both time and a stable mid face. Surgical cricothyroidotomy Seldinger. Video courtesy of Therese Canares, MD, and Jonathan Valente, MD, Rhode Island Hospital, Brown University. Once intubated, the obtunded patient requires assisted ventilation. The trauma surgeon also begins assisted ventilation in any patient with decreased respiratory drive or an unstable chest wall. Ineffective ventilation after securing an airway may be due to malposition of the endotracheal tube, hemothorax, or pneumothorax. Careful auscultation of the chest to confirm symmetric breath sounds and chest percussion both are necessary. Tracheal deviation may occur in the setting of a tension pneumothorax. Chest radiography is essential in evaluating the patient but should not replace physical examination in the emergency setting. For example, if the patient is hemodynamically unstable with a suspected tension pneumothorax, perform needle decompression before radiologic examination. The trauma team must gain control of hemodynamics in the unstable shock-trauma patient. Two important steps must occur in rapid succession. Hemorrhage must be controlled with direct pressure, and IV access to begin fluid replacement must be attained. Apply compressive dressings to bleeding wounds, while avoiding blind attempts at controlling hemostasis. The role of pneumatic antishock garments is controversial; they should be placed only by an experienced trauma team. Place a minimum of 2 large-bore IV lines for fluid resuscitation, beginning with 1 L of an isotonic electrolyte solution such as lactated Ringer solution in adults (infused at a rate of 20 mL/kg in children). Next, further catheterization may be placed to monitor urinary output or central venous pressure. The trauma patient may experience hypovolemic, vasogenic, or neurogenic shock, depending on the mechanism of injury. Most commonly, hypovolemic shock occurs because of intravascular volume depletion caused by whole blood loss. Patients may lose as much as 15% of circulating blood volume before demonstrating signs of hemodynamic instability. Early signs of this loss are tachycardia, decreased pulse pressure, mild anxiety, and mild tachypnea. Urinary output may also begin to slow. Systolic blood pressure begins to decrease with blood volume loss exceeding 30% of normal blood volume. These signs increase dramatically as blood loss increases. The body attempts to compensate for hypovolemic shock with high sympathetic output, increasing systemic vascular tone, and resistance. In addition, hypovolemia causes antidiuretic hormone release by the posterior pituitary and renin release by the kidney. Both releases serve to promote systemic vasoconstriction and fluid resorption in the kidney. Chemomediators play an important causative role in vasogenic shock. In vasogenic shock (which includes septic shock), vasomotor resistance markedly diminishes. Physiologically, the patient experiences vasodilation, increased capillary permeability, and hypotension. With sepsis, patients are at high risk for multiorgan failure secondary to hypoperfusion and should be treated aggressively with fluid resuscitation and other methods of increasing oxygen delivery. In neurogenic shock, vasomotor tone again decreases. Severe spinal cord or brain injury may cause this failure of sympathetic drive. Patients with such spinal shock may demonstrate hypotension without tachycardia. In fact, bradycardia may be observed. Overall decrease in systemic vascular resistance leads to increasing venous capacitance, decreasing venous return to the heart, and therefore, decreasing cardiac output. Again, fluid resuscitation is essential; in this instance, replacement serves to increase the diminished cardiac output by increasing venous return. Similarly, placing the patient in the Trendelenburg position may help. After completion of the initial cardiovascular resuscitation, perform a thorough physical examination of the patient. Additional monitoring devices can be placed and laboratory tests ordered. Consider a toxicologic screen in addition to CBC, serum electrolytes, and liver function tests (LFTs). A nasogastric tube may be placed but should not be used in the patient with suspected nasal and skull base injury, in which case an orogastric tube is safer. Evaluation for cranial and brain injuries is the next and most critical step. Obvious skull injuries or brain trauma require neurosurgical evaluation and intervention. Evaluate and address level of consciousness as measured by the Glasgow coma scale (GCS), pupillary function, and extremity weakness. The GCS is a widely accepted system evaluating eye opening, verbal response, and motor response (see below). Each category is rated on a point scale, increasing with level of response, with the sum totalling between 3 and 15. Pupillary function is judged for equality, size, and response to light. Extremity weakness can be noted in the cooperative patient or in the obtunded patient, when observed for response to painful stimulus. Brain CT scanning is essential for definitive diagnosis in the obtunded patient or in the patient in whom brain injury is suspected. Perform a full cranial nerve (CN) examination by checking for motor and sensory function of all branches. For example, identification of an immediate facial nerve deficit can determine the need and timing for surgical intervention. The systemic CN examination may be incorporated into the comprehensive head and neck examination. Once the critically or neurologically injured patient has been stabilized, perform a complete history and physical examination in a step-by-step manner. Note mechanism of injury, velocity, and any delayed injuries. If possible, question the patient for any subjective symptoms because the patient might localize pain and numbness or report diplopia, bitter nasal discharge, trismus, or malocclusion. Starting from scalp to neck, examine the patient for step-off fractures, entry and exit wounds, or lacerations. 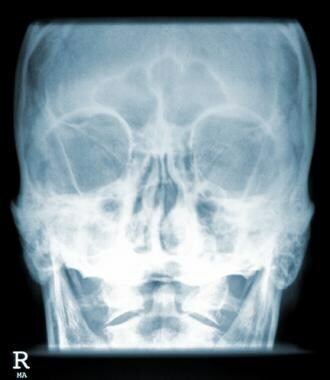 A frontal sinus fracture may be accompanied by significant swelling and may be discovered only by radiographic examination. The orbit examination is the next important step. Note diplopia, proptosis, enophthalmos, and orbital rim fractures. Suspect corneal injury in the painful eye with ciliary injection. Lack of corneal reflex can be observed with injury to the sensory division of CN V or the motor division of CN VII. A sharply demarcated red area on the sclera appears with subconjunctival hemorrhage and is often associated with orbital rim fractures. Additionally, check the lacrimal apparatus for obstruction. The pupils were assessed earlier but should be reexamined for hyphema. Loss of the red reflex may suggest a retinal detachment. Check CN II by assessing gross vision and visual fields because unilateral blindness suggests a lesion of the optic nerve. Such a lesion provides no direct or consensual response to light stimulation. A Marcus Gunn pupil suggests a partially impaired optic nerve and is present when the impaired eye is stimulated with light, producing a weak direct and consensual response. The healthy eye is tested next, yielding a strong bilateral response. When the impaired eye then is immediately flashed, the weak eye cannot overcome the dilation effect from the strong eye now in darkness. Extraocular movements controlled by CNs III, IV, and VI can be assessed with range-of-motion testing. Oculomotor nerve paralysis could cause ptosis, lateral eye deviation, and no light or near response. With CN IV paralysis, the eye cannot look down when turned inward. CN VI function can be tested more simply with lateral gaze testing. A forced duction test is appropriate to distinguish between nerve paralysis and muscle entrapment when orbital rim fracture is suspected. Furthermore, test the patient for nystagmus, noting its direction and field of gaze. Perform fine-cut (2 mm) CT scanning and consult an ophthalmologist for any suspicion of orbit injury. In conjunction with the orbital examination, evaluate the nasoorbitoethmoid (NOE) complex. A series of subtle observations, as well as gross physical palpation, helps diagnose NOE fractures. For example, if present, note telecanthus using a standard normal intercanthic distance of 30-34 mm. Often observed with NOE fractures, rounding of the medial canthus and overall shortening of the horizontal palpebral fissure can suggest medical canthal tendon injury. Next, observe the nasal profile for loss of dorsum or saddle-nose deformity. Despite the possible presence of extensive edema, careful nasal palpation and examination may yield nasal bone and cartilage fractures or septal hematomas. Additionally, presentation of various odors to the patient can be used to assess CN I function. Note that copious secretions or blood may obscure the sense of smell. As observed earlier, extensive hemorrhage must be controlled. In this area, epistaxis can be controlled with either anterior or, if necessary, posterior packs. Extensive nasal bleeding may require dilation of a Foley catheter in the nasopharynx to tamponade the bleeding. If this procedure is required, monitor the patient for associated bradycardia or respiratory suppression when the catheter is placed. Persistent epistaxis may require ligation or angiography and subsequent embolization of the internal maxillary artery (or even the external carotid artery). Do not overlook a lateral examination of the skull, starting with each ear. Perform an otologic examination to visualize hemotympanum, perforated tympanic membrane, or cerebrospinal fluid otorrhea. Examine the pinna for hematoma or laceration. A laceration of the external auditory canal, particularly of the anterior wall, could signal a condylar neck fracture. Additionally, careful palpation may reveal a lateral skull fracture. The Battle sign (ecchymosis behind the pinna) signifies a skull base fracture as well. Finally, when possible, perform a Weber and Rinne test to document hearing or hearing loss. As the examination progresses, palpate the zygomatic arches for depression. Similarly, check the malar eminence for recession, which may be assessed in continuity with the inferior orbital rims. While examining the face, pay attention to assessing the sensory function of the trigeminal nerve branches. Additionally, the motor function of the facial nerve must be assessed as early and as accurately as possible. This information, combined with the patient's ability to generate tears ipsilaterally, can help pinpoint a facial nerve injury to a site distal to the geniculate ganglion. Next, address the midfacial skeleton. 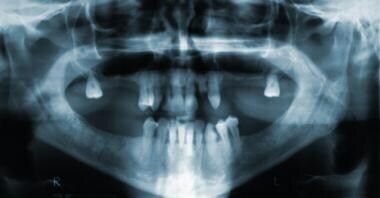 Either a loose maxilla or a retracted mid face could indicate a Le Fort fracture. Palpate the maxillary dentition and alveolar ridge for fracture and fully evaluate the oral cavity. In addition to assessment of occlusion, check the mandibular teeth for fracture, laceration, or looseness. A dental consult may be warranted. Palpate the entire mandibular body, both angles, and the ramus to the temporomandibular joint. Of note, bimanual palpation is useful for detecting mandible fractures. With a patient who can cooperate, numbness of the lower lip and gingiva can help indicate an inferior alveolar nerve injury. Additionally, assess the motor function of the trigeminal nerve, although this may be difficult in the setting of significant edema and trauma. Check the tongue for laceration or injury. Lateral tongue deviation could indicate a CN XII injury on the side of deviation. Uvula deviation and a failure of the soft palate to rise on the injured side when asking the patient to say "ah" indicate paralysis of CN X. Finally, the parotid duct must be examined carefully, which may require cannulation to prove damage in the presence of a deep laceration along its course. The neck is the next step in a complete otolaryngologic examination. To some extent, the neck has already been partially addressed during the initial trauma evaluation because it encases both the airway and important vascular structures. As mentioned earlier, unstable patients require immediate intervention, which may possibly include surgical neck exploration. In the more stable patient, again examine the neck for localized injury and detect any masses, pulses, hemoptysis, laryngeal architecture disruption, or crepitus. Maintain the neck in a neutral position to avoid cervical spine injury. For all penetrating neck traumas, check the neck for entry and exit wounds. Because a clot may provide temporary hemostasis and the course of a penetrating injury is unpredictable, deep exploration of a neck wound in a nonsurgical setting is contraindicated. At most, gently examine the wound for penetration of the platysma muscle. If deep injury exists, the neck can be divided into 3 different zones with specific treatment pathways. Although some controversy exists concerning management of penetrating neck trauma, essentially zone 1 lies below the cricoid cartilage, zone 2 lies between the cricoid cartilage and angle of the mandible, and zone 3 lies above the angle of the mandible. Because zones 1 and 2 may involve large vessels lying within either the thorax or skull base respectively, these zones may require angiography prior to further treatment. 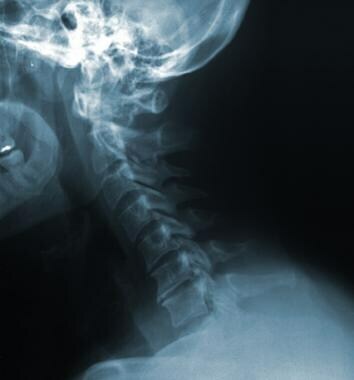 In general, most stable but symptomatic patients require formal neck exploration; thus, the otolaryngologic history and physical examination are extremely important. The conscious patient can contribute tremendously to the neck examination. For instance, the patient may report hoarseness, dysphonia, or dysphagia. Additionally, the cooperative patient may perform a shoulder shrug, thus allowing assessment of CN XI. Other tests of CN XI, such as testing ability to turn the head, are safe only after the cervical spine is cleared from injury. Finally, in the cooperative patient with a stable airway, fiberoptic laryngoscopy can be an extremely useful diagnostic adjunct. CT scanning of the brain often is the first imaging study performed of the head and neck region. CT scanning with orbitofacial cuts can be performed in the stable patient in whom maxillofacial trauma is suspected. 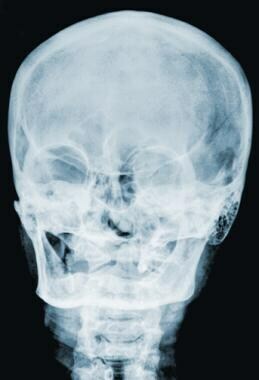 CT scanning is the best radiographic modality available for evaluating facial fractures (see image below). Often, the patient may not have a stable cervical spine, eliminating the possibility of obtaining coronal images; however, coronal reconstruction can be performed with 5-mm axial images. 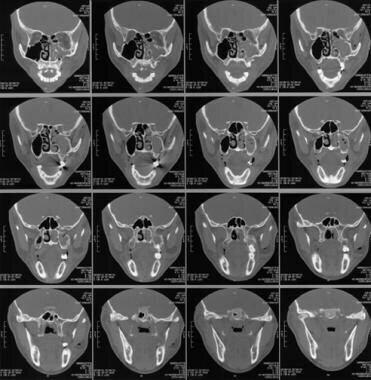 Orbitofacial CT scans showing maxillary sinus and zygoma fractures on axial view. CT scanning of the neck often is useful for neck injuries. For instance, CT scanning of the neck performed with 1-mm cuts of the larynx is an excellent diagnostic tool for laryngeal fractures. Additionally, in stable patients with penetrating neck injury, the use of IV contrast and oral Gastrografin contrast with CT scanning may help elucidate vasculature or pharyngoesophageal injuries. Alternatively, Gastrografin-swallow plain radiography can be performed for suspected esophageal injuries. Although plain radiography has lost favor since the advent of the more sensitive CT scanning, it can still contribute useful information. 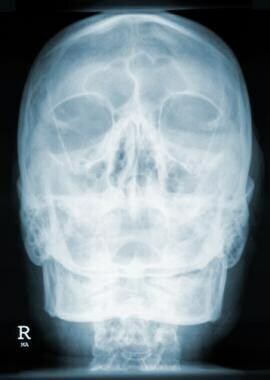 A routine skull series does not demonstrate facial bone details because of the higher x-ray exposure needed to visualize the skull. The standard facial radiograph series includes Waters, Caldwell, lateral, and, occasionally, base views (see images below). Orbitofacial CT scans showing maxillary sinus and zygoma fractures on coronal view. Both the Waters and the Caldwell views are posteroanterior (PA) projections, a technique allowing closer distance between the face and the film for better detail. The need to extend the patient's neck is a large disadvantage to PA views, unless the patient's cervical spine has already been cleared. The Waters view or occipitomental projection is taken at an angle 37° caudal to the canthomeatal line. This view optimally visualizes the superior and inferior orbital rims, nasal bones, zygoma, and maxilla. The Caldwell view, angled 15° caudal to the canthomeatal line, allows additional views of the frontal sinus and superior orbital rim. The 6-ft Caldwell view is helpful intraoperatively for frontal sinus obliteration surgeries. The lateral view is useful for the anterior frontal sinus wall and anterior and posterior maxillary sinus walls. The base or submentovertex view allows visualization of the zygomatic arches and any impingement of these bones upon the coronoid process of the mandible. 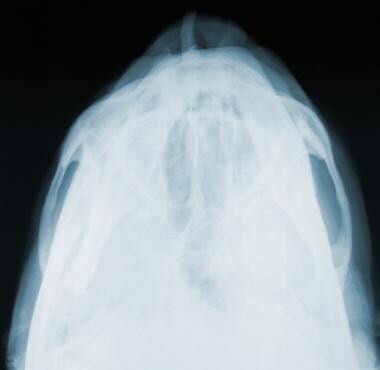 Mandible radiography includes a PA view to assess fractures of the body, angle, and lower ramus of the mandible. Lateral oblique mandible views visualize the body, angle, ramus, coronoid, and condylar processes of the mandible. Additionally, a Towne view taken 35° caudal through the frontal bones and between the temporomandibular joints helps to better view the mandibular condyles (see images below). Dental radiographs or occlusal views provide excellent visualization of the alveolar ridge, teeth, and symphysis. Posteroanterior (PA) view of mandible. Lateral oblique view of mandible. 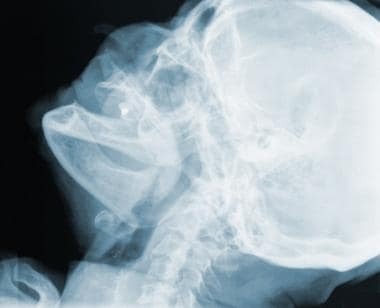 The Panorex radiograph provides superior information for the evaluation of mandible fractures (see image below); its panoramic view allows visualization of the entire mandible and is highly regarded by all maxillofacial surgeons, although distortion of the image occurs anteriorly because of the limitations of the radiograph. Panorex radiograph of the mandible showing parasymphysial and body fractures. Angiography may be warranted in the patient with copious bleeding in the nose or with penetrating trauma to the neck, especially of zones 1 and 3 or certain areas of the maxillofacial skeleton. A trained interventional neuroradiologist may combine the angiography with a therapeutic embolization. Further neuroradiologic information may be obtained with magnetic resonance imaging (MRI). MRI can offer excellent assessment of the CNS and the soft tissues of the head and neck. Notably, MRI is particularly useful in cases of facial nerve injury. Costly and time-consuming, MRI is not generally indicated in the acute trauma setting. The otolaryngologist, in conjunction with the ED trauma team, performs a focused, step-by-step evaluation of the trauma patient. As always, begin with the ABCs and carefully evaluate the patient with a guided complete history, physical examination, and radiologic examination. The key to successfully treating the patient with acute maxillofacial trauma is thoroughness and understanding of the immediate priorities. The acute scenario can have long-term sequelae and therefore demands both a strong contribution from the otolaryngologist and the knowledge and cooperation of a skilled trauma team. Hillel AT, Pandian V, Mark LJ, et al. A novel role for otolaryngologists in the multidisciplinary difficult airway response team. Laryngoscope. 2014 Sep 24. [Medline]. Odom SR, Howell MD, Gupta A, Silva G, Cook CH, Talmor D. Extremes of shock index predicts death in trauma patients. J Emerg Trauma Shock. 2016 Jul-Sep. 9 (3):103-6. [Medline]. [Full Text]. Hopper RA, Salemy S, Sze RW. Diagnosis of midface fractures with CT: what the surgeon needs to know. Radiographics. 2006 May-Jun. 26(3):783-93. [Medline]. Druelinger L, Guenther M, Marchand EG. Radiographic evaluation of the facial complex. Emerg Med Clin North Am. 2000 Aug. 18(3):393-410. [Medline]. Agrillo A, Sassano P, Mustazza MC, Filiaci F. Complex-type penetrating injuries of craniomaxillofacial region. J Craniofac Surg. 2006 May. 17(3):442-6. [Medline]. American College of Surgeons. Advanced Trauma Life Support Course Student Manual. 1989. Bates B, Hoekelman RA, Thompson JE. A Guide to Physical Examination and History Taking. 5th ed. Philadelphia, Pa: Lippincott-Raven; 1990. 518. Belli E, Matteini C, Mazzone N. Evolution in diagnosis and repairing of orbital medial wall fractures. J Craniofac Surg. 2009 Jan. 20(1):191-3. [Medline]. Cummings C, et al, eds. Otolaryngology Head and Neck Surgery. St. Louis, Mo: Mosby-Year Book; 1998. Jamal BT, Diecidue R, Qutub A, Cohen M. The pattern of combined maxillofacial and cervical spine fractures. J Oral Maxillofac Surg. 2009 Mar. 67(3):559-62. [Medline]. Jenq KY, Panebianco NL, Lee PA, Chen EH, Dean AJ. Diagnosis of a Facial Artery Pseudoaneurysm Using Emergency Bedside Ultrasound. J Emerg Med. 2009 Feb 5. [Medline]. Keenan HT, Brundage SI, Thompson DC, Maier RV, Rivara FP. Does the face protect the brain? 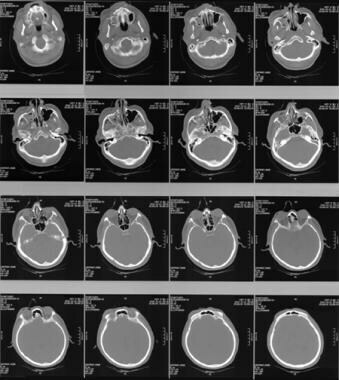 A case-control study of traumatic brain injury and facial fractures. Arch Surg. 1999 Jan. 134(1):14-7. [Medline]. Mathog RH. Maxillofacial Trauma. Baltimore, Md: Lippincott Williams & Wilkins; 1984. McConnell DB, Trunkey DD. Management of penetrating trauma to the neck. Adv Surg. 1994. 27:97-127. [Medline]. Novelline RA. Squire's Fundamentals of Radiology. 5th ed. Cambridge, Mass: Harvard University Press; 1997. 537. Pappachan B, Alexander M. Correlating facial fractures and cranial injuries. J Oral Maxillofac Surg. 2006 Jul. 64(7):1023-9. [Medline]. Plaisier BR, Punjabi AP, Super DM, Haug RH. The relationship between facial fractures and death from neurologic injury. J Oral Maxillofac Surg. 2000 Jul. 58(7):708-12; discussion 712-3. [Medline]. Sabiston DC. Textbook of Surgery. 15th ed. Philadelphia, Pa: WB Saunders Co; 1997. 296. Zadik Y, Levin L. Oral and facial trauma among paratroopers in the Israel Defense Forces. Dent Traumatol. 2009 Feb. 25(1):100-2. [Medline].